It's club run time again on Sunday March 1 - and this time we're off to Chipping! 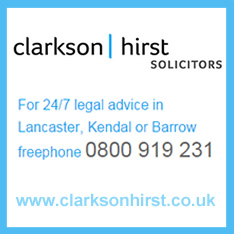 Lancaster's Clarkson Hirst Solicitors has kindly agreed to sponsor Lancaster Cycling Club next season. The company has pledged some funding to provide prizes for riders taking part in the Salt Ayre time trial season for 2015. Lancaster Cycling Club's winter club run season is starting soon! These friendly social rides are open to riders of all abilities. No chain-ganging and no one left behind - just come for a ride, a chat and a brew (and possibly some cake too). Keep an eye on the club Facebook page for times, dates and routes. Meet at the Edge bike shop in Chapel Street, Lancaster, at 9.15am for a 9.30 start.